Today I post the first in what I hope will be dozens of guest essays written by teachers, students, and blog readers. This one is by Kacina Pfeiffer, a brilliant middle school reading and writing teacher at Theodore Potter School 74, Indianapolis, Indiana. 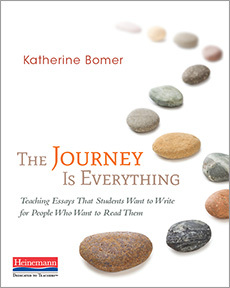 Kacina attended a two-day summer writing institute I led, which was focused on teaching and writing essay as a journey of thinking. The institute was sponsored by the Indiana Partnership for Young Writers (indianayoungwriters.org), a phenomenal professional development organization where I’ve consulted and collaborated for at least sixteen years. Kacina was inspired to write because she had CHOICE of topic. She was living her topic, so it seemed to be literally waiting for paper to put it on. The bigger idea she comes to, that she feels most herself when she is super busy, came from the writing to think she did in her notebook. I haven’t asked Kacina at which point of the process she found her metaphor of the race car and track to describe her hyper-active life, but it certainly works well in this essay, and she wisely decides to open with it, and carry it through to the end. Notice that this essay does not follow a template or standard 5 paragraph formula, where the thesis statement resides in the first paragraph, with 3 supporting paragraphs and a recapitulation at the end. Instead, it pulls you in with the powerful race track metaphor, sets up the “experts” about how to live our lives, then tears those experts down swiftly and beautifully in three rhythmic sentences, all beginning with the essayist’s language of thinking , “Perhaps,” and comes to a realization rather than a conclusion, ending in a trumpet call of independent clauses: I want this and this and this, and I’m willing to accept the danger of my decision. I love the contrariness of this piece, a common voice or tone found in many essays that live in the world, where Kacina takes the current wisdom—that we should take time for ourselves, simplify, slow down, appreciate the merits of doing nothing—and turns it on its head, claiming that in the busyness of life, family, and work, she finds her identity and what is most important to her. Take a moment and think about daring to drive a race car. Imagine your speed climbing to a quickness that causes everything in your peripheral to blur. Imagine the car screaming around a track. It is dangerous. It is exhilarating. It travels over 240 mph. You know full well that at any moment it could spin out of control, cause life altering damage, break into a million bits…if you let it. In that moment the only thing you can see is one single solitary focal point directly in front of you. You may not even realize how fast you are going because of your intense focus to keep from crashing. I listened to the experts. I took pause from the racing and gave into all the selfishly indulging things a person does when you begin to coast. I idled by the pool. Drifted down the highway of housewife drama in another Liane Moriarty novel. Took a three-mile run. Parked myself alone on the couch, unmoving, in an endless Netflix marathon. Although I tried desperately to suppress the urge, I could see in the rear view the realization that I tend to put myself right in the middle of all the things I love, the things that fundamentally make me whole, make me who I am. To step away from that, even momentarily, makes me feel breathless. Wrought with worry. Wondering what if I missed a moment of that to be—alone? Perhaps I find solace in the busy. Perhaps it’s where my soul resides. Perhaps it is in the busy that I find the best version of myself. After all, aren’t we all searching for those pieces of ourselves that we want to hold onto tightly? It could be that I stumbled upon an unexpected place – a place different from yours – to find myself. In my race, I’ll hold on for dear life and go as fast as I can because I want an adventurous marriage; I want to see the look on my girls’ faces each time they make the winning catch; I want to be there for each bruise; I want to show my children what it means to not give up; I want to prove that I can do all the things I set out to do, even if they didn’t believe I could do them; so I push on, and I’ll race forward ignoring the fuzzy edges in my peripheral that warn me of danger.